I wrote this for the teenwolfexchange. @ofhamartia asked for a few things, for people to say why they love the characters they do, to add a personal headcanon, and last but not least, what they imagine the characters want to do when they grow up, or if they’re adults, where you’d imagine them in ten a fifteen years. So I’ll be doing a series of these for several characters, starting with my personal favorite character, and the one character whom I’ll watch and rewatch the show for over and over again. 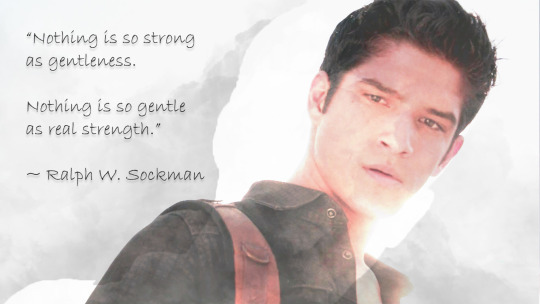 Scott is one of those characters that are best described as kind. That’s the very essence of his being. That he is kind. He is caring, considerate, loving, responsible, reliable, and has a damn bad habit of taking responsibility for everything that goes wrong around him. Scott was just a kid when we first met him, and in six years our time, two from his perspective, he managed to grow into a true leader, the kind of leader who leads by example and understanding, rather than by trying to dominate or control others. A mentor to others, and the kind of inspiration that even adults felt hard to ignore. He’s probably one of the best and most understanding friends a person can hope for. Too selfless by far, especially once you pass the s4 marker. He’s forgiving to a point, giving people second, third, and even fourth or fifth chances. One of the things about Scott is that he inspires those around him to be better. Whether it’s his friends, or his (former) enemies, it’s hard not to try and become a better person when you’re around someone like Scott. He never tries to shine at other’s expense, and is in general more concerned with other people’s wellbeing than with his own. It’s why most of the time I want to take the poor depressed nigh suicidal boy, wrap him up in a blanket and keep him somewhere warm and safe where no one can hurt him. It’s why I want so desperately to see him able to stop Monroe’s crusade so he can go to college, be a kid for a while and then become the veterinarian that he’s always wanted to be. Scott is also wise beyond his years, holding a vision of a better world, but instead of just dreaming, he tries to force that vision upon the world, and possessing the strength and will power to make that happen. And it’s that strength of will that made him rise to true Alpha. He’s a rational minded kid, who cares so much, that he’ll take risks if other people’s lives are in danger, but won’t throw himself at a threat, just for the sake of it. But most of all, he’s the kind of kid, who’d be perfectly happy, leading a boring life, doing his homework, getting a job, a family, playing sports. But who can’t bring himself to do just that, as long as other people are suffering. And it’s just that, that makes him a hero. As for a headcanon in regards to him. I probably have too many. But the one that’s currently playing in my head is that after the series, Scott went and studied further martial arts and especially BaguaZhang (aka the martial arts craft that Deucalion used on Teen Wolf). This is an art aimed at using your opponent’s force against them, and tends to specialize in fighting multiple opponents at once. Which just feels perfect for Scott and what he needs it for. He’ll of course keep busy, being an alpha isn’t the kind of thing you can just push aside, but he’ll graduate as a veternarian, and maybe even learn how to use his werewolf abilities to not just take away pain, but actively heal the sick. He’ll be the kind of alpha others come to for advice and maybe marry Malia, or find new love, who knows, have children, a life, and hopefully find happiness, which is all I want for him.